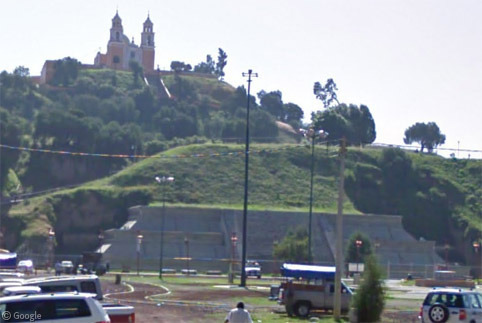 The Great Pyramid of Cholula in southern Mexico is a little-known archaeological site which may once have been the largest pyramid (by volume) in the world. 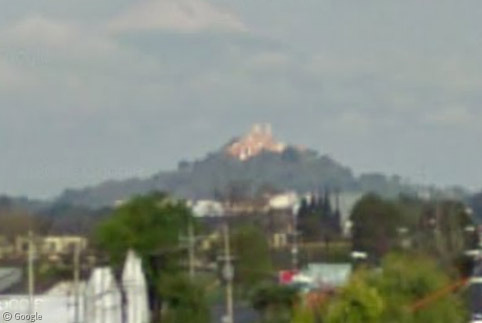 Also known as Tlachihualtepetl (‘artificial mountain’), the pyramid has a base 450m square – four times the size of the Great Pyramid of Giza in Egypt. At 66m tall it is considerably shorter than the more well known monument, though its total volume would have been much larger. While the satellite view above doesn’t give a real sense of the location, Street View gives us numerous different perspectives. Rampant tropical plant life has grown over the pyramid; from a distance it looks like a natural hill topped by a Church. 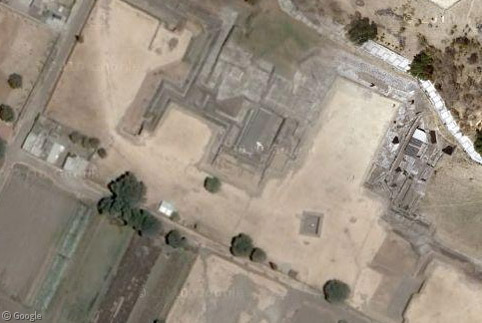 The pyramid was built as a temple in what was at the time Mexico’s second largest city. Its size is in part a result of four distinct stages of construction between the 3rd century BCE and the 9th century CE. Each development increased the overall size of the structure, and beginning in the 1930s, excavations of the interior have revealed a complex history of which little can be sensed from the outside. Archaeologists exploring inside the pyramid have created 8km of tunnels and discovered several different structures including the small adobe pyramid in the north-west corner of the site, and more recent – and much larger – stepped stone structures. Some of these have areas with detailed painted murals. Several hundred sets of human remains have also been discovered, including some apparently from human sacrifices. 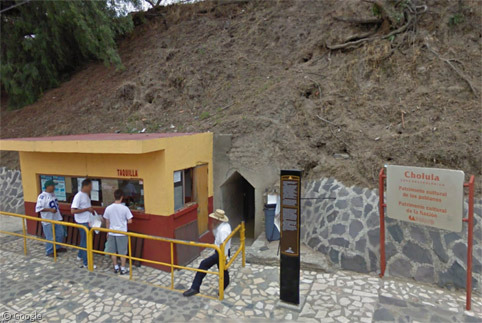 About 10% of the tunnels are open to the public, accessible from a ticket booth and low doorway on the northern side. There is little of note on the exterior of the pyramid – these steps visible on the west side are not part of the original structure – they were reconstructed by archaeologists. To the south of the pyramid is an area known as the Courtyard of Altars which contains at least three altars and numerous large stone sculptures. 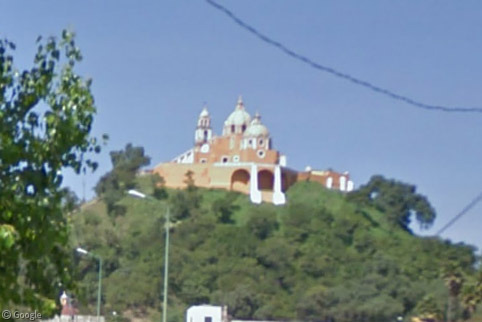 The Church which crowns the site is the Iglesia de Nuestra Señora de los Remedios (Church of Our Lady of Remedies). 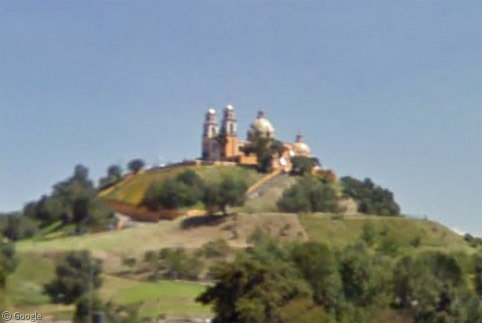 It was built in the late 16th century by Spanish colonials and is now a major pilgrimage location for Mexican Catholics. In recent decades further excavation of the pyramid has been limited because of the religious significance of the site and the Church. Similarly, the general belief is that there are many more features of archaeological significance in the surrounding area that will never be discovered because they are on private property. You can learn more from the detailed history at Wikipedia, and see some images at the Aztec History and Sacred Destinations sites.